Fear is one of the key adrenal responses; the body cools and tenses as breath quickens and hackles rise. Eyes and mouth flood with sensory data and oxygen. It is obsessed with the future, anticipating the worst yet tied to surprise so much that Charles Darwin described it as "…so far akin to it…" and a symbol of loss of control and ultimately, loss of survival. Bill Tancer in his book Click found people looked into fears about environments (heights), people (intimacy, rejection, clowns), animals (snakes), situations (success, death) and movement (flying, driving). Other surveys include spiders, water, enclosed and open spaces and the perennial favourite, public speaking. Extensive lists of phobias are found at Wikipedia, the eponymous Phobialist.com and Call of Cthulhu. Engendering fear in a game environment has the added complication players aren't usually in an environment to enable or enhance fear so blase responses to horrific events become the norm. Wading in rat-infested sewers while being hunted by cannibals is probably a big deal. Not everyone has the facility or inclination to game in a disused warehouse or abandoned hospital so it's worth considering how to bring the fear. 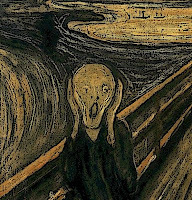 Fear has cognitive stablemates like distrust, dread, horror, panic and terror. There are common hooks that nearly everyone has; death, ostracism, loss of control. Finding ways to bring these into play can help heighten or foreshadow fear. Being hunted by cannibals in a town where everyone thinks you're unclean, criminal or heretic turns the screw. It's also a qualitative phenomena - reasons for fear can be tied to individual attitudes and mores (a rogue may fear being caught more than death by poison) so the same thing may have a different response depending on player or character. Attacking character strengths or taking advantage of vulnerabilities is an effective way to engender fear on an individual and qualitative level. Fear is primarily concerned with avoidance or escape; to allow these is to release tension. Deferring that release is OK for a short period of time; dragging it out can wear thin. Dr. Richard Kimble and Number 6 were allowed victories and escapes from time to time and this tradition goes back further than Flash Gordon and Superman with Republic serial last-minute escapes. The rogue being chased by cannibals through rat-infested sewers was poisoned with something giving her the shakes in a theocratic town known for intolerance. Acting in concert, each stimulus racks up the tension until things get interesting. Raising the stakes in this manner is a good thing; remember in all this to let characters take effective action; don't cripple or incapacitate them with modifiers. Loss of control may be an issue for some players whose motive to play is vicarious empowerment. Equally, some players have hot buttons or issues around specific items or concerns. Respecting boundaries and issues is crucial. The game is a game and not worth jeopardising friendships over. Who wants to be a jerk about it? Heroism is about transcending challenges and fears to achieve greatness among peers. Fear is omnipresent as a survival reflex but heroes are known for courage and doing it anyway in the face of fear.